Some historical picture accounts claim this is a photo of Coca-Cola advertisement used in the 1936 Berlin Olympics. 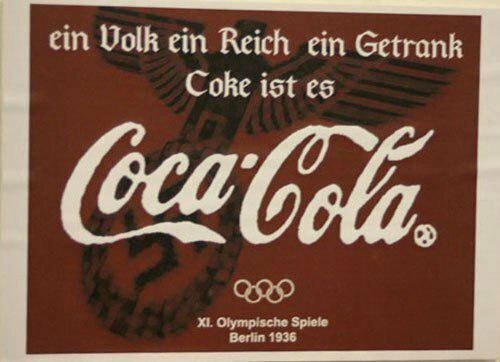 German text: “ein Volk ein Reich ein Getrank, Coke ist es”. Trademark: the circle-R was not introduced for usage until 1940s – in the Trademark Act of 1946. Unfortunately this image has ended up in historical ad collection sites such as the Ad Branch. All other Coca-Cola ads in that page are real, but somehow this fake one ended up there as well. Coca-Cola company did sponsor the 1936 Olympics, but this advertisement is just digital artwork made in 2004.